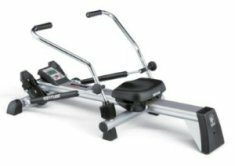 The Stamina Body Trac Glider is an entry level rowing machine with gas shock resistance and hydraulic rowing arms. With a list price of $230 and a sale price of just $140, it’s a decent basic machine. This is as basic as it gets. A steel frame with an aluminum center beam, rowing arms, a molded seat and a small LCD monitor that displays time, strokes rowed during session, total strokes over life of rower and calories burned. If you like, you can set the display to scroll the information at six second intervals. Reviews for the Stamina Body Trac Glider run the gamut from five star praise to harsh criticism, but the majority of reviews are squarely middle-of-the-road. These are the most realistic, as they take into account a simple fact – this is an inexpensive, basic machine. 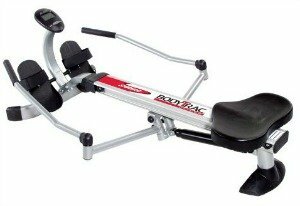 Users all say that the Body Trac gives you a decent rowing action and enough resistance for a beginner, but that there isn’t enough resistance for anyone who’s been training for a while. The biggest complaint seems to be that the foot pedals don’t hold your feet securely because there is no bottom lip on them. If you’re just starting out and want a cheap rower that can be folded and stowed away, the Glider is a good choice as long as you keep its limitations in mind. The console is extremely small and gives only basic information and the 250 maximum user weight is limiting for some. Also, don’t expect this to be the most comfortable seat you’ve ever sat on. It’s molded plastic and doesn’t have the cushioning we’d prefer, but for a decent, 20-30 minute workout it’s fine. Noise can be a problem for some, but it’s really not any louder than some rowers that cost twice as much. All in all, the Stamina Body Trac Glider is a decent “start-up” rower for casual users or beginners that will give you a year or two of reliable exercise. Plastic parts and thin metal for the rowing arms are the price to be paid for the extremely low sticker price. After you’ve used it for a few years, you can graduate to a better machine.